Independent strategy game developer and publisher Argonauts Interactive is excited to announce the return of the premier conquest simulator, Colonial Conquest, based on the classic turn-based strategy game of the same name. After three decades, a new era of Colonial Conquest is now available on Steam for Windows PC. The original Colonial Conquest released in 1985 and was a trailblazer for historically-based strategy wargames and still maintains a passionate fanbase to this day. Colonial Conquest has a long-standing legacy for being one of the first games of its kind to allow players to battle for global supremacy and alter history by taking control over the world’s major territories. Argonauts Interactive is honoring that legacy by offering players the ability to return to the era of Golden Warfare and gain global dominance through aggressive expansion and annexation of Major Powers in order to shape the world as they see fit. Argonauts Interactive embarked for Kickstarter to crowdfund their successor to the original Colonial Conquest, where they received an overwhelming amount of support and exceeded their pledged goal. Set in the Victorian age of warfare and expansion of the late 1800’s and early 1900’s, Colonial Conquest features six playable countries – USA, Great Britain, France, Germany, Russia and Japan – and over 130 regions open to conquest. Players will sail, ride and march across the globe as they manage their empire’s resources, categorically dismantle opposing empires using cloak and dagger tactics such as subversion and espionage, and build attack fleets to strategically position themselves as the world’s sole leading power. Players prevail over their opponents when they earn the most Victory Points or reach a region’s VP threshold. Each region includes their own variable income rates and earnable VP points, all unknown until conquered or spied upon. Each region not owned by a Major Power usually has an independent Minor country owning and defending it. Throughout the game’s three turn-based phases and three historical scenarios, players will build and continually expand different aspects of their warring empire to lead themselves to victory. With such playable national leaders as Theodore Roosevelt, Queen Victoria, Jules Ferry, Tsar Alexander III Romanov, Kaiser Wilhelm II, Emperor Meiji, and Jules Ferry, players will manage their empire’s resources, build their armies, and contest against sophisticated AI or their friends via online multiplayer as they fight for control over the world’s territories. It is the end of the 19th century and the world is ripe for conquest. 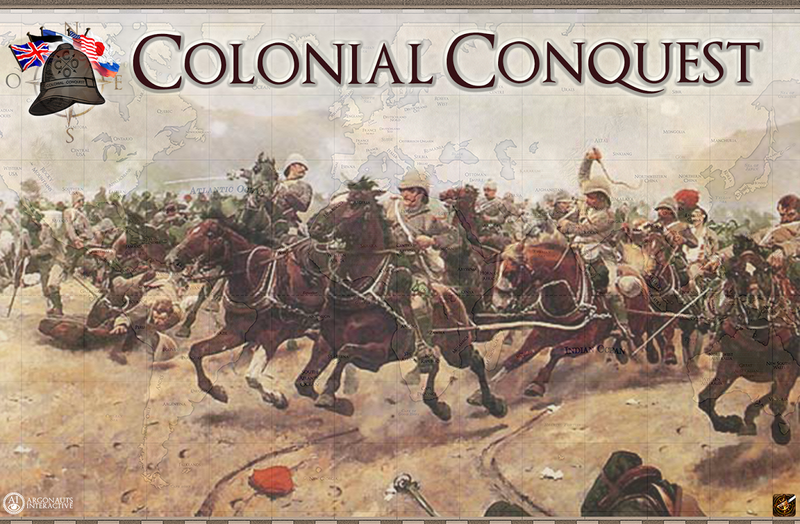 Colonial Conquest is available for purchase on Steam for $9.99 here: http://bit.ly/1Jud844.